The Olympic-sized swimming pool has indeed accommodated training (and reigning) Olympians. Across from the front entrance are two bronze plaques honoring Brad Snyder and Nicole Haislett respectively, two prior champions. Nicole Haislett won Olympic gold in Barcelona in the 1992 Summer Olympics (she is a three-time Olympic gold medalist) and is a former world record-holder with a historied past of collegiate and national championships. Brad Snyder won gold in the 2012 Paralympic Games in London. Snyder is a true hero and inspiration – just look him up online and you’ll see what I mean. 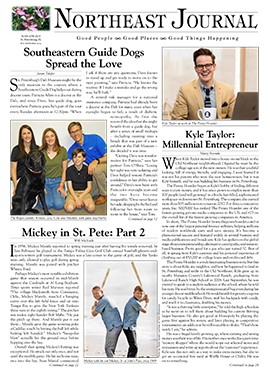 A former Navy lieutenant and specialist on the explosive ordinance disposal (EOD) unit, Snyder served in Afghanistan and was blinded by an IED while helping victims of another bombing. He holds the world record for 100-meter freestyle among fully blind swimmers. He has also won several medals at Prince Harry’s Warrior Games over the past few years. Now that the most recent games in Rio have come to a close, it’s time for another plaque at Northshore Pool. 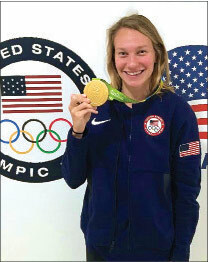 At this year’s Olympics, Melanie Margalis of Clearwater, who has trained at Northshore with the St. Petersburg Aquatics (SPA) since she was ten years old, brings home her first gold medal. 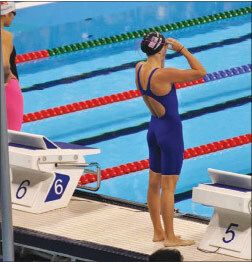 Melanie won her gold in the women’s 4 x 200-meter freestyle relay. She had an incredible performance in her first Olympics also coming in 4th place in the women’s 200-meter individual medley. Though she started at a young age (10), Melanie didn’t compete seriously until high school when she pursued a swimming scholarship. She received one for the University of Georgia, where her swimming career started to flourish. She became a member of the USA Swimming National Team in 2013, following in her brother’s footsteps. Robert Margalis, who also trained with the SPA, had a high-ranking career in swimming, becoming a silver medalist at the Pan American Games in 2003 and 2004. Besides Melanie, the SPA had several others competing at the Olympic qualifiers this year. Megan Romano has also been on the USA Swimming National Team in prior years and completed her third Olympic trials this year. She also trained at the University of Georgia. It was the first Olympic qualifying meet for 20-year-old Calvin Bryant, who currently competes for Florida State University and has ranked among the top-10 swimmers at FSU for long-distance events (500-yard freestyle and 1650-yard freestyle). Melanie proudly holding her gold medal. The experience can be overwhelming: high security on the pool deck, and recognizable prior Olympians in the next lane. On top of that, swimmers are kept separate from their parents and coaches. For first-time qualifier Robert (Bobby) Finke, only 16, it was a good thing he had some support in his fellow swimmers – two of whom were his older sisters. Autumn Finke, who now trains at the University of Florida, competed in this year’s Olympic trials along with her younger sister, Summer Finke and their younger brother. It was a proud day for the Finke family – while SPA’s Coach Joe Finke, their father, watched from the stands. Bobby grew up with his two older sisters acting as a pair of additional coaches, understandably. “He was really pounded on at practice,” chuckles Coach Lewis. Bobby smiles at the memory. The additional coaching seemed to work: Bobby is currently ranked one place (11th) behind Robert Margalis’ all-time records of 9th and 10th place in individual medley (IM), a combination race of the four swimming strokes (butterfly, backstroke, breaststroke, and freestyle). Other Olympic qualifiers include newcomer Peyton Palsha, who is a high school sophomore like Bobby. Peyton’s bubbly demeanor on deck contrasts with her intensity in the water. She is a 2014-2015 USAS Scholastic All-American swimmer and multiple state finalist, and she recently took three first-place finishes at the 2016 Florida Swimming Short Course Senior Championships. SPA head coach Fred Lewis with Peyton Palsha, Bobby Finke, and Autumn Finke. Aside from long hours in the water, land-based cross-training includes 45 minutes of ab work three times a week, as well as strength training three times a week. Seemingly innocuous things like wearing a too-heavy backpack, or worse, only bearing a backpack’s weight on one shoulder, can cause fatigue and potential future injury. The coaches instill the importance of this into their swimmers throughout the school year. And so on it goes. St. Petersburg’s swimming tradition continues. Perhaps we’ll see plaques with more of these familiar names on them one day. These young swimmers certainly have visions of gold and the discipline to achieve them. Just one more thing for us locals to be proud of.